Tuesday: Lunch at 11am. Bingo at Noon. 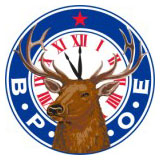 Thank you to the Butcher & the Blonde for their first dinner at the Elks! Member Steve Williamson's wife, Vicki, passed away on April 5th. No service information at this time. Member Jim Whitney passed away. Services are pending. Tentative plans are St. Louis Catholic Church on Monday April 17th at 10am. Reception to follow at Tri-City Elks. Please check the local obituaries for final time and date. Copyright © 2017 Tri-City Elks Lodge #2541, All rights reserved.